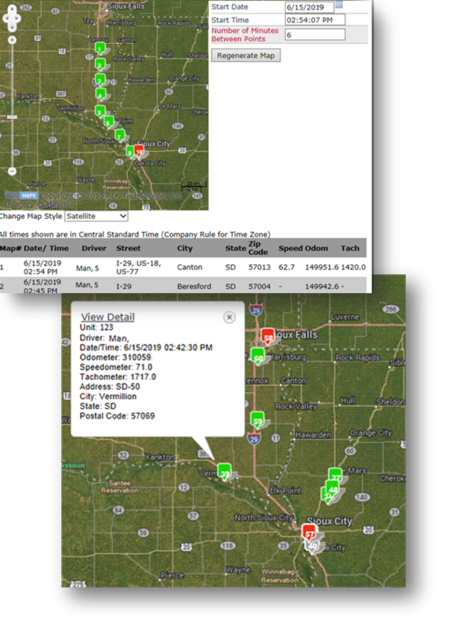 J. J. Keller® Encompass® Fleet Management System with ELogs offers mapping and geofencing features to help your fleet become more efficient. With these features, you’re able to offer better customer service and improve unit and fuel efficiency. The mapping screen has several viewing formats including satellite, road atlas, night and more. Color-coded pins alert you to engine data - idle, moving or inactive. The geofencing feature of Encompass lets you know when a driver enters and leaves a geofence you’ve established. Reporting gives you details of each driver’s trip including when, where and how long a load or a driver was detained. With Encompass, you establish custom landmarks using address or GPS coordinates, then create a radius or a polygonal geofence around the landmark so you can easily identify out-of-route miles and detours taken by drivers. You can also use this feature to establish thresholds for reasonable service level expectations.